Martin was on hand to discuss the state of Aboriginal education in Canada, and more specifically the Martin Aboriginal Education Initiative, a charitable organization he established to support programs that improve education at the elementary and secondary levels for Aboriginal Canadians. 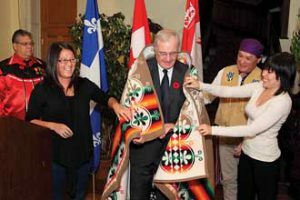 Forty per cent of off-reserve Aboriginal students do not graduate from high school, Martin said, while that figure reaches 60 per cent for students going to school on reserves. Furthermore, on-reserve schools, which are administered by the federal governments and not the provinces, do not have the support structure school boards provide, and receive some 20-40 per cent less funding per-capita than do off-reserve schools. This, to Martin, amounts to a glaring act of discrimination. Increased per-capita funding to on-reserve schools was thus one of the solutions Martin went on to discuss, along with increased parental involvement and ways of sharing best practices, such as program his Initiative has created with respect to replicating successes of model schools, as well as business and accounting mentorship. He also spoke of tackling the indifference of other Canadians toward the ongoing struggles decades of discrimination have brought about in their own back yards. “Everywhere I go in Africa I find young Canadians who are working to help in the Third World, Martin said. “The real question is, how many of them are going to understand that we have our own Third World at home, and that they had better start helping at home as well? Dean of Arts Christopher Manfredi took the opportunity offered by Martin’s visit to announce an important gift from the Counseling Foundation of Canada, which has committed nearly $360,000 over three years to support Indigenous Access McGill, an innovative project in McGill’s School of Social Work focused on giving support to students from First Nations and Inuit communities studying in the health and social service disciplines.